First, let’s begin by understanding what the runtime error r6034 is and why it happens. A runtime error is basically a software or hardware problem that prevents a program from working correctly. 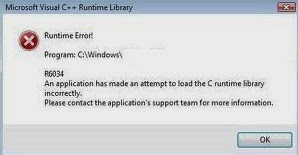 Runtime errors can occur if you are running a software that isn’t compatible with your system or with some other program it shares resources with. They could also happen if your computer has memory (RAM) problems, or if the computer has been infected with a virus. When these errors happen, they might cause you to lose information in the file you’re working on, or even corrupt the file completely (which happens in many cases) which prevents you from using the software that file is associated with. Now that we know what this error is, let us take a look at how we can get rid of it. Apple Application Support (if you can’t get this one off, just ignore it). If the iTunes version that caused this error is the latest one, try re-installing your old iTunes version (check your downloads folder). If not, try downloading and installing the latest version, if the error still shows up, repeat the procedure but this time, install an older iTunes version than the one you had. Your install would work and the error would become non-existent in your computer. If your error r6034 originates from Windows Explorer, an option is to roll back the state of your system to a date before the error started appearing. You can accomplish this by using System Restore. If you are on Windows 7, click on the Start icon then type System Restore, the first result is the one you should click on, then follow the instructions to take your system back in time. If you are on Windows 8, move your mouse to the right side of the screen to bring up the right pane, click on the search icon (magnifying glass), then type ‘system restore’ into the search box, click on it when it appears on the right side; if it doesn’t, make sure ‘Settings’ is highlighted beneath the search box. Find the executable file (.exe) of the program. If you have a desktop shortcut, right click on it then choose ‘Open file location‘. Right click on the .exe file, choose Properties. Look near the bottom, tick the box for Run this program as an administrator. Now, try running the program again, hopefully this time there wont be errors. If you still encounter the error r6034, then uninstall all components of that software, download a newer version then reinstall.